Dek found a new passion in Kyoto. Rocks. I mean really, who needs hundreds of years of history, palaces, gardens and temples. My boy had pebbles of every shape and size. The rock switch first turned on when we stepped through the gates to Nijo Castle. Surrounded by a gravel path, the castle grounds were a rock lovers dream. Dek didn’t care that we were standing in front of a UNESCO World Heritage Site. He didn’t care that castle construction began in 1603 and was completed by Shogun Iemitsu in 1626. He most definitely did not care that the castle grounds were made up of the Ninomaru Palace, Honmaru Palace and surrounding gardens. He just wanted rocks. Sometimes I wonder why we take him anywhere. Then I remember. Our travels are not only about him. It’s about us too. Being a rock haven, strollers were not exactly easy to use. Dek had to walk most of the way, which was just fine with him. 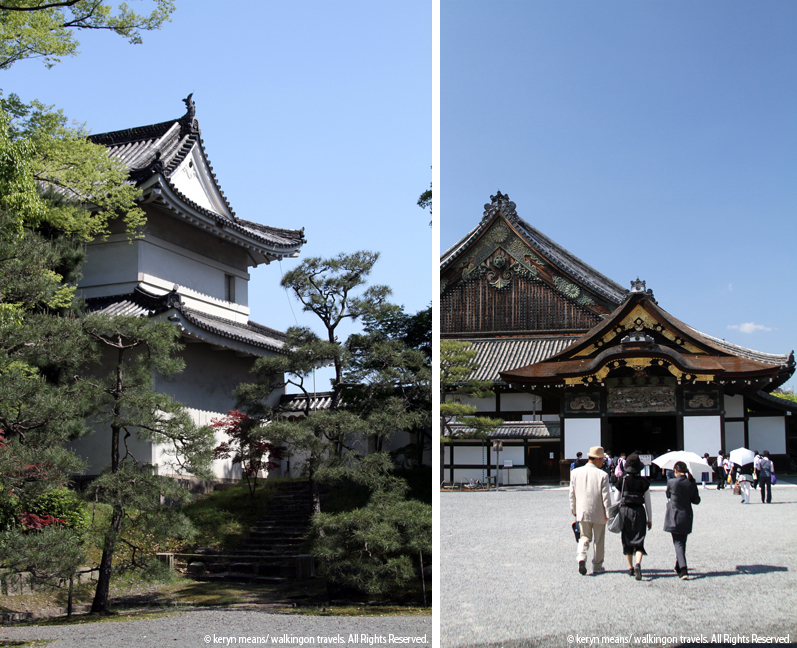 Once we entered Ninomaru Palace an attendant tagged our stroller and kept it up front until we had finished our tour of the interior. Honestly I wish I had left it with her the entire day. 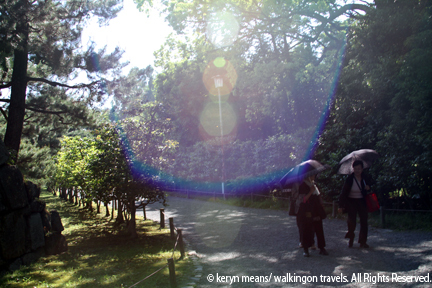 Strollers and gravel don’t mix as we were later reminded at the Imperial Palace. When we got our shoes off and tucked into the provided cubbies another attendant informed us that we had to carry Dek through the building. I can understand this. With so much history, you can’t risk a toddler taking out a 400-year-old screen. Actually the original screens had been removed a while back. They are now housed in the 400th Anniversary Gallery (also on the castle grounds.) You have to pay an extra fee to see the originals. The replicas were good enough for us. One of our favorite aspects of the palace was not the artwork you could see. It was the “nightingale” floor. When we walked along the floorboards, they squeaked and chirped almost like birds. This was to keep the bad guys out and gave the shogun advance warning of someone approaching. There were also false walls and secret doors for the shogun’s bodyguards to jump out of at the first sign of trouble. It must have been rather stressful being the high honcho of the Edo period in Japan. When we finished our loop of the palace, Dek was thrilled to get his shoes back on. He immediately continued his exploration of the gravel path. Meanwhile, I checked out the Ninomaru Garden. 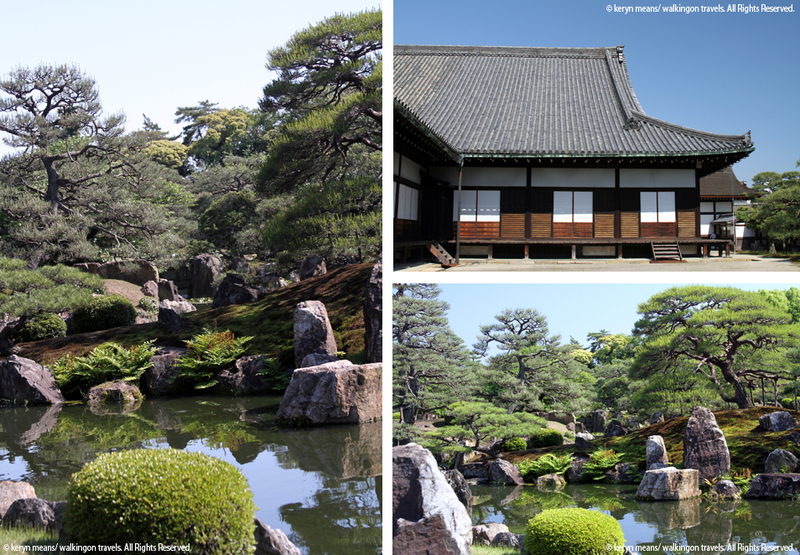 Originally designed by master gardener Kobori Enshu (at least that’s what the pamphlet said), the garden was a wonderland of rock, water and foliage. I couldn’t help but marvel at the effort involved in maintaining such an impressive landscape. I just wanted to spread a blanket out and take a nap. Even with loads of tourists wandering around, it was so peaceful. Sadly the garden was fenced off. We moved to the second section of the castle that housed the Honmaru Palace. At first we weren’t going to go up. There were big stairs. It was hot. Dek was getting cranky. I was getting tired of asking him not to chuck rocks at people. I did a little scouting mission. I hadn’t paid almost $15 for Mike and I to just see a garden and the inside of one palace. Of course we didn’t consult the pamphlet we had been given when we bought our tickets. That would have been way too sensible for us. It would have also told us that another palace and garden where up there. Exiting the palace grounds (not to be confused with the castle grounds), I found a small covered sitting area. I pulled out the picnic lunch I had packed. Dek kicked rocks as he munched away on his sushi. Mike and I got to enjoy a few quiet moments- a rare occurrence as Dek gets older. Come to think of it, I might just carry a bag of rocks from now on. Who needs toy cars? We’ve got gravel! When my oldest son was about Dek’s age and in England, he was serious rock collector. He picked up rocks at every place we stopped, He has quite a rock collection even now. A lovely place! I have lots of rocks and still collect them. I always get a rock or two everywhere I visit. Then I take a piece of the energy of that place home with me! It seems more people are learnign to love rocks again not just because they are pretty, but alos for the energy support they provide. And you were SO smart to have packed a picnic lunch. I am still kicking myself for not doing that! You had too much gloom, I had almost too much sun. We were there around high noon. Thank goodness for a polarizing filter! After I read your post about trying to find lunch I was so glad we had packed one. I happened down this little market road on our walk from our rental to the castle. We found a huge Fresco supermarket with a ton of takeaway food. It was perfect. I feel like each trip we take I’m learning a new trick as to how to keep us all happy and fed. It’s a whole different ball game when you have a kid in tow. I’m not the only one who gets cranky now. Ha! Found this post on the homepage of wordpress today – enjoyed it, thanks for the read! Would you ever be open to sharing a story with our blog? Absolutely stunning. Those gate stones are huge! Beautiful pics – looks peaceful – great place for sure to check out the rocks. I had a fascination for leaves, acorns and pinecones growing up. Thanks for sharing – Congrats on being FP! Thanks everyone for stopping by. It’s a bit overwhelming being FP, but I am so grateful that people think I am worth checking out. I’m also learning about other blogs I hadn’t seen yet, which is always exciting. Oh yeah. My toddlers are not getting any ‘toys’. Rocks and leaves, fruit and sticks. Insects and sunshine. Who needs plastic?! heehee. I say this now… who knows what will happen! I’m hoping the rock thing sticks. Although I know my dad was happy to get rid of my childhood rock collection when I went to college. I’m thinking we will make a little travel rock garden in the backyard one day when he actually insists on taking them home with us too. As long as he doesn’t eat the rocks, right? 🙂 Sounded (and looked) like a fun trip. …but he was clearly having so much fun with the rocks! Awesome! Fun post…beautiful pix and family. Congrats on it all — travel, Freshly Pressed, great attitude about rock throwing, etc. My Mom always complains that she did all of the fun, interesting trips when I was too young to remember everything. She took me to the grand canyone when I was still a toddler, and a bunch of other trips. It sounds like he had a good time though and the pictures look great! Ha, my wife and I are considerably older and still like to collect rocks, shells, wood on trips. (As long as it’s not in a nature preserve or protected area of course.) Great post. beautiful place. so peaceful. thank you for sharing. I like rocks & stones!!!!!!!! fabulous photos! amazing views and structures. I would completely dread strolling on those rocks. Ugh! Walking wasn’t so bad. Thankfully I wasn’t in heels! But the stroller was useless. Not a bad thing though since all the walking wore my boy out and he took an awesome nap that afternoon. Amazing place! As for your son, maybe your little rock lover will turn out to be a geologist, who knows? He’s between geologist, mechanic, train engineer and carpenter at the moment. It will sure be interesting to see what he does end up doing further down the line. That reminds me of taking our twins to Egypt just before their 1st birthday. We were in such incredible historical sites – the pyramids, Egyptian temples – but they played with rocks. They just didn’t seem to have that sense of awe and wonder that we adults have. Love the photos! very interesting. Thanks for sharing! Great place, thanks for sharing and congrats on being freshly pressed. Nice to see you traveling with a little one. I was beginning to wonder if it would even be possible… or if my traveling days were inevitably over! My little man is due next month:) Great post! Your travel days are in no way over! If anything, they are about to get better. I got on a plane with my son for the first time when he was 3 months to fly cross country. Then we went to Hawaii. Then off to China. Twice. He is an amazing traveler. I think it has a lot to do with our attitude. We want to get out and explore the world and he just has to come along too. It’s not necessarily more difficult, it just takes a little more planning. I can’t wait to hear about your own adventures as your little man enters the world. Huge congrats and best wishes! Thanks so much, you’ve given me a new outlook on air travel with baby. Lets hope mine is as good of a traveler as yours! very informative! when do boys grow out of rocks? my husband, in his 30s, still likes to play with and collect rocks. I don’t think they ever grow out of toys and rocks. We went to 3 toys stores while in Japan and my husband was in hog heaven with the action figures. We had to make more room in the suitcase for all his finds. 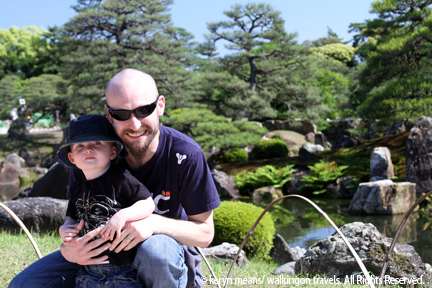 It sounds like you have strong feelings about visiting historical sights with children. Do you have some great alternative activities? What do you do with your kids — any tips? Lovely photos and story! 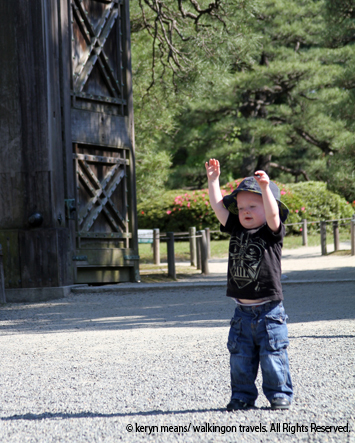 And picking up stones is charming and age-appropriate behaviour for a toddler whether he is in his own backyard or a historical place on the other side of the world. Beautiful looking place! Great pics! I’m currently living in Okayama, Japan, and I have never noticed the rocks so much. I definitely should! How they all fit together, and how many rocks they must of had to go through to get them to fit together mind boggling. Thanks for sharing such a nice information. When my kids were little and into rock collecting and I couldn’t afford a lot of souvenir items from our trips we would bring them home and the kids would paint their names or initials (depending on the size) and the place and sometimes date and put them in our yard, vacation rock garden. But, what a pain if you move. Great blog. Once he is old enough to want to bring something home, we might start a travel rock garden in our yard too. Just a little way to keep our amazing travels with us. I have a friend who brings one rock home, writes the name of the place on it and then puts it in a basket by the front door. That might be a little easier to move. I love collecting rocks, so does my son. It is fun! Beautiful pictures and nicely written. Absolutely stunning! What a lovely boy he is ! Thank you so much for sharing these photos and your thoughts. I’d love to visit, but lots of little miracles would have to happen first. Looking over your photos and reading your post was the next best thing. Awesome styled buildings and precious zen gardens! I DO need a castle! lol but rocks i guess is ok… oh and the little boy is sooooo cute!!!!!!!!! I needed a castle too! The best thing about the rocks is that it gave me and my husband two minutes of peace to actually experience and view the castle for ourselves. When traveling with a toddler, any distraction is a welcome one if it let’s mom and dad check out the amazing history we have traveled so far to see. Its so nice to see people travel with their small children. We have friends that won’t take trips because it’s too hard. But I plan to jet set with my daughter, I think its good for them. When I was a kid I used to attack the tiny pebbles anchoring my aunt’s bonsai plants in those wide, flat earthen pots. I went at them with a paintbrush and a pair of tweezers, pretending I was an archaeologist, then sorted them out on the floor by color and size. Left scratches all over the linoleum, it did. Pebbles and gravel are heaps of fun!